Beginning with the kingdoms of the Congo in the 14th and 15th centuries, and their histories, this volume analyzes the influence and pressures of the Portugese, the Catholic Church, and slave traders on these blossoming African states. Included are reports by Portugese and English discoverers and missionaries, such as Livingston and Stanley, as well as documents about the colonial history of the Belgian Congo, Angola, and Rhodesia/Zimbabwe, which centuries later mirrorred the kingdoms of Zimbabwe and the Mwanamutapa. Texts on the post-colonial period include the writings of Patrice Lumumba. 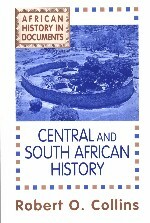 The South African section contains documents about native people and the first Dutch settlement in the seventeenth century, including the introduction of slavery; conflicts between settlers and British missionaries as well as with the native states; white conquest; Boer history and myths; British colonial policy; the discovery of diamonds and gold; and apartheid. The new political era includes the early writings of Nelson Mandela.